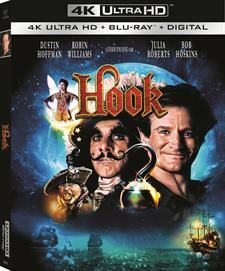 Download Hook in Digital HD from the iTunes store. Hook images are © TriStar Pictures. All Rights Reserved. Who didn't grow up with the beloved story of Peter Pan? Can't you just remember of watching Wendy, John, and Michael as they learned to fly and followed Peter to Neverland? And of course who could forget the lovely fairy, Tinkerbell who was so jealous of Wendy that she tried to sabotage Wendy every chance she could. It was a wonderful and magical movie that only could have been imagined by Disney animators. 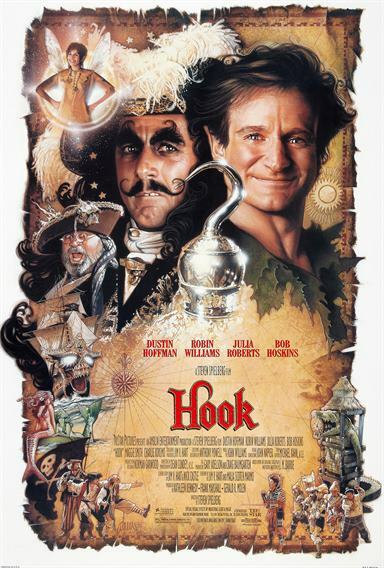 Almost forty years later Tristar Pictures brought us the next chapter when they released Hook in 1991. Now the film has become available for purchase on 4k Blu-ray bringing this updated story to a whole new generation of Peter Pan fans. We meet Peter (Robin Williams; Good Will Hunting) - now Banning- as an adult…I know! Who would have thought Peter Pan would have grown up!?! But he did and now, having forgotten who he really is, Peter lives as a grumpy mergers and acquisitions lawyer and father to two children, Jack (Charlie Korsmo; Can't Hardly Wait) and Maggie (Amber Scott). When the family heads to London, Granny Wendy (Maggie Smith; Downton Abbey) tries to remind Peter of who he truly is but to no avail. Suddenly, after a flash of light, Peter discovers his children have been kidnapped and he must remember in order to save them. Helping Peter is none other than his favorite fairy, Tinkerbell (Julia Roberts; Pretty Woman) who reminds Peter to think of a happy time in his life prompting him to fly once again. Then they fly off together to Neverland to rescue his kids from their kidnapper, Captain Hook (Dustin Hoffman; Tootsie). With the help of the lost boys, Peter must fight Hook to get his kids back but in the process, he remembers who he is and finds his happiness that he lost so long ago. With an all-star cast Hook should have been a shoe-in to rake in profits at the box office but the script and storyline were off-putting and Hook only did modestly in theaters. It was an imaginative idea and should have made adults nostalgic for the more innocent times in their lives but somehow the message got lost in translation. The 4K release is very well done though. With 2160p high definition video quality, the picture is sharp with a vibrant color palette throughout. The audience will truly see a difference with the HDR color. The Dolby Atmos is a nice surprise with a robust and deep vocal track that enhances the viewer's experience. The audio is clean and clear throughout. The combo pack offers a 4K disc, Blu-ray disc and a digital download that utilizes movies anywhere. There are only two extras in the package, which are the theatrical trailer and 11 never before seen deleted scenes. I must say the lack of extras, especially of the usually extraordinary and brilliant Williams is a little disheartening. For Peter Pan fans everywhere, Hook is a reminder of a time when we were young and carefree. It is a life lesson to always have fun no matter what. And, while not his best work, Williams is still brilliant and should be remembered for all his works including this one. Pick up this movie and reminisce of a simpler time in your life and if you have young children be sure to share it with them. This a life lesson taught with an excellent cast and in an entertaining manner.